Raising your children would be so much easier if it came with an instruction manual, wouldn’t it? While I like to think I’m doing a decent job at it, I’m not in the habit of telling other people how they should raise their kids… just kidding, I have no actual idea what the hell I’m doing and I just make it up as I go along while trying not to totally sabotage my son. 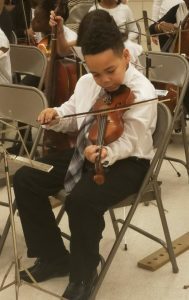 Little dude at his school’s winter concert. Raising your children properly really hit home for me recently. My son is 10. He plays a musical instrument, as I did when I was his age. Back then, my dad – the musical whiz who was the drum major of his band in high school, who still to this day plays multiple instruments, was trying to teach me to play the piano. I knew how to read music and I knew which key was which note. My dad was trying to teach me to play the bass clef and I was trying, but just couldn’t get it. I told my dad I wanted to call it a day. Suddenly he jumps up from the bench, says “FINE” and stormed off to his bedroom, slamming the door behind him. My son’s been playing baseball since he was in kindergarten, and I’ve been coaching his teams. Recently, he’s been struggling. He doesn’t enjoy it because he’s not as good as the other kids anymore and tells me he doesn’t want to play this year. As the coach, the former captain of my high school team, and an ex-Army NCO, I try to explain to him “Look, buddy, I coach those kids. Trust me, they’re not better than you are, you just have a poor work ethic. You don’t practice, you don’t develop any skills, you can’t retain what I taught you. That’s why.” He’s not trying to hear it. “It’s just boring, dad.” Inside, I’m fuming. WHY IS MY SON SUCH A QUITTER? WHERE DID I GO WRONG? Just then I had a light-bulb moment. I was experiencing the same thoughts my dad had! 20+ years ago, my dad got frustrated with me because he saw me, his oldest biological son, as he saw himself. I just wasn’t feeling the piano, and to my dad’s mind, if he could do it, I could do it, right? But I wasn’t him. I like music, but I’m not musically talented like him, and more importantly, I just didn’t have the desire to learn as he did. This is how I was looking at my son and didn’t realize it until that moment. If I could learn these things, couldn’t he? Well, maybe he could. He just didn’t want to. He’s his own guy. And that’s okay. As a father, involving your kids in extracurricular activities is always worth the effort. But sometimes they’ll just decide they’re not into something and forcing it is simply counterproductive. I don’t believe in teaching your kids that quitting is an alternative but if they gave it a shot? Fine. There’s plenty of other stuff to do. Your kids probably look a lot like you, they might speak like you, or even move like you. But they’re not you. The best thing you can do is start raising your children to be who THEY want to be. A key tenet of fatherhood is finding that thing your child IS into and encouraging them to pursue it through all of the obstacles.